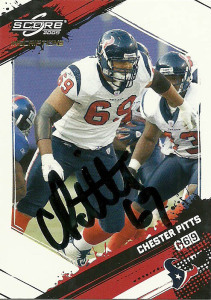 Chester Pitts for being such a mainstay and popular player on the original Texans had very few cards made of him. He was an added bonus to the GMC NFL event that was being held in Katy that day, and since they had stuff that he could sign, I had no problem picking up a freebee. Afterwards he was willing to pose for a photo with me. It was not a well advertised or supported event as there were not that many fans there at all. I went ahead and got his autograph on the additional Score 2009 Signatures card- which as a card baffled me because I would have thought that if it said ‘signatures’ on it- it should already have a certified autograph on it, but I digress. 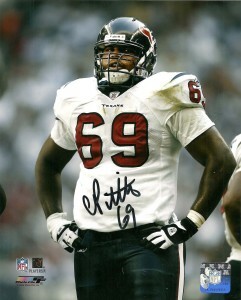 After retiring from football Chester has remained busy as an ambassador, and frequent Texans commentator. 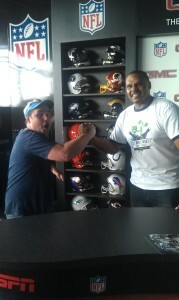 He also was on 23rd The Amazing Race with former teammate and friend Ephraim Salaam. While they did not fare well and were eliminated early on, they provided fans of the show plenty of laughs. He’s also become a financial advisor, has his own charitable foundation and in 2016, he was named an ‘Honor Warrior’ by his Alma Mater.